The importance of honesty can be discussed in many contexts with children although perhaps none are quite as delightful as Little Croc. Little Croc’s Purse by Lizzie Finlay is engaging, funny, full of fabulous illustrations and has some important moral lessons thrown in. Little Croc finds a lost purse full of coins during a game of hide and seek. His friends try to persuade him to keep it as ‘no one returns things nowadays‘ however Little Croc is adamant that the purse should be returned to its owner. Will his honesty be rewarded or will he be tempted to spend the money? He is certainly tested when he tries on his ‘dream boots’! Little Croc delivers the purse to the police station and the owner, Mrs Doolally, rewards him for his honesty. Delighted, Little Croc decides to spend some, share some and save some of his reward. It is difficult to impress on children the differences between saving, spending and giving money. I know there are specially designed money boxes to force the hand with pocket money but to younger children, the concepts of saving and charity are somewhat abstract. 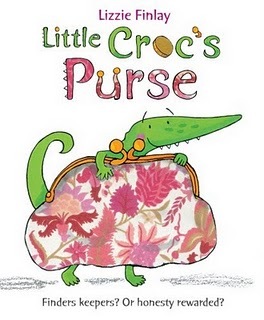 Whilst Little Croc’s Purse is essentially a story about honesty it also explores saving, spending and giving in a simple and memorable way – Little Croc does end up buying his dream boots, he treats his friends to lemonade and puts a coin in his piggy bank (with big plans for when he saves more). The illustrations are charming and each pointy-nosed crocodile is quite a character, from the slightly goofy Little Croc to the menacing bully Murdock and the haughty moustached waiter in ‘Croc Monsieur’s’ restaurant. Other neat touches to note – well-chosen collage and the very clever use of different fonts to give words expressive quality all combine to make Little Croc the most charming of crocodiles. Little Croc’s Purse is available from Fishpond for $16.99.